When considering a solar PV system, it can be very hard to know what to look for. You can spend countless hours researching products and review sites to make sure you are getting a quality system. If you’ve done all this research, you might be trying to steer clear of the cheap equipment and decide that you will only go for the best on the market. That is an excellent choice. However, you’re still not guaranteed a great performing system. A solar PV system is more than a bunch of components simply strung together. 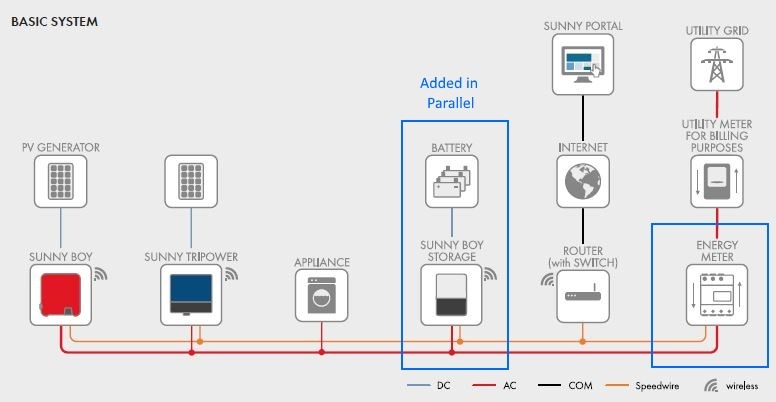 It appears simple – a few panels placed on the roof and connected to an inverter connected to your switchboard. Unfortunately, today’s systems and regulations are more complicated than they used to be. Having the cheapest guys install your system might end up costing you dearly, even when using the best equipment. We won’t go into all the issues you might come up against with a cheap solar system. You can browse through the Crap Solar Facebook page to see what you might be getting into. We’ll focus on how the service of the company installing your system makes a difference to the performance with a real life case study. When an inverter produces more power than what is being consumed at the time, it pushes the excess back into the grid (called exporting). In doing this, it lifts the voltage a bit. The further away from the grid and the smaller the cables the more the voltage rises. Recent regulations mean that when the voltage rises too high, the inverter has to either reduce power output or cut off entirely. This is a situation you want to avoid! If you live on a larger property, your power supply may be running quite some distance from the street. Even if it’s not that big a property, if you’re installing the solar on a shed then you could be introducing extra distance and the cabling could be smaller than we need. Your solar provider must take this into account before quoting the system. If you in this situation and they don’t mention it, then they may not be considering your best interests (or just not know what they are doing). 3 Phase Solar will provide alternatives or walk away from a job that will cause too much voltage gain. Even if you live in metro areas, there is a good chance voltage issues may still affect you. With more and more people installing solar, there are more and more systems pushing the voltage up a little bit. Even if it doesn’t impact you on day 1, it may be a problem in a year or so down the track. You will need to count on your installation company to help you out when this happens. We recently installed the absolute best quality system you can buy. It had 18 x SunPower E20 327W panels (5.9kW) connected to a Fronius Symo 5.0 inverter (5kW). These are both the best on market in their categories. This is a system we’d love to install for every customer. The Fronius Symo is a 3 phase inverter which is required when the customer has a 3 phase supply. Normally, this means the voltage issue should be less of an issue: we are only putting 1/3 of the power down each phase so the voltage rise is 1/3 that of a single phase inverter. When we installed the system, completing the work in the afternoon when the sun was low in the sky, we commissioned everything and the system was working perfectly. We hooked up the monitoring and showed the customer how it worked and how to read the display and said we’d keep an eye on the system to ensure it was actually working correctly. At 11:15am the voltages are over 250V. This is the point at which the inverter is required to start limiting its power to prevent voltage rise. The voltage is still rising so the power reduces a little more in response. 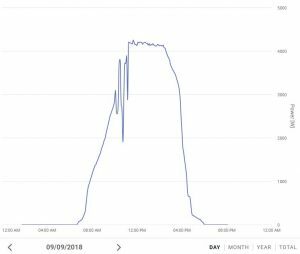 By 2:20pm the system is no longer able to produce as much power so drops away as it normally would. It gets worse though. The next day, there was a voltage surge to over 257V! The inverter disconnected to protect itself. The voltages never recovered that day and all output from the surge onward was lost. Because we actively monitor every system we sell (since we have a performance guarantee to meet) we received notification of these events. We looked at the data and saw the voltage issues. At this point, you might immediately blame the distributor but it’s better to check you haven’t done something wrong on your end. Since we install extra metering at the connection point, I could see there was no local cabling issue. It is 10m to inverter so if we had done something wrong, there would be a noticeable voltage differential between the two monitoring systems. We contacted the local distributor to see if anything could be done. Since this was a once off event, they couldn’t agree to do anything their end but allowed us to adjust the parameters in the inverter. Luckily the inverter is top quality and has the flexibility to be reprogrammed so we went out the next day and adjusted it. This is a new installation so we’re still waiting on the results. There have not been the ideal conditions since we rectified it, but there have been no further performance limitations due to voltage since. When we get another good day, we will post the output curve to show how this fixed the system. Even if it doesn’t fix the system completely, we are proactively monitoring the situation. If the voltages remain too high we will request the local distributor adjust the voltages in the street so this does not happen again or at least so rarely it does not significantly affect production. Had we not gone to the effort to setup and configure monitoring systems for the customer, it is quite possible this issue could have done undetected. The typical customer who walks past the inverter to look at the display and see’s it working just wouldn’t notice. Considering there is a move from just about all inverter companies to remove displays entirely, this will further hide the issue. Most modern systems have built in monitoring but setting them up is not always included or guaranteed in the cheap prices advertised. Additional monitoring can also be installed to measure your consumption and provide performance assessments so you can make better use of self generated energy, ensure top performance and see exactly how much the system is saving you in real dollars. We include this as standard since it gives extra information right at the connection point (some distributors are harder to convince there is a problem). From this case study, you can see that using a proactive company with excellent service levels and technical experience can ensure your system performs at it’s best. Simply going for the best equipment (at perhaps the cheapest price) does not guarantee you a well performing system. So how do you know the company will look after you? They will ask questions about your energy usage AND the site before the sale. They will listen to you and not necessarily agree with everything you tell them (eg. best placement of panels). They will be knowledgeable and be able to answer most of your questions on the spot. They will want to see the site. Most systems work ok when first installed so people tend to leave nice reviews as they are excited at this time. Look for reviews about their service when issues occur after installation (it happens). You won’t feel you are simply getting a sales pitch. They are trying to provide a service to you and meet your needs. If it doesn’t feel right, then perhaps look elsewhere. Or simply come to 3 Phase Solar for your system. We will provide expert advice and a good value quality system. We’ll actively support you to ensure top performance for the life of the system. We’ll have your back. The Victorian Government has announced a new program to help reduce the cost of solar PV systems for up to 24,000 households in the state from 19 August 2018 to 30 June 2019. The rebate will cover up to 50% of the cost of the system, up to $2,225 for eligible households. They equate this to 50% of an average 4kW solar panel system which sounds about right for a bare bones standard system. Premium systems can cost more and there are a lot of low quality systems available for less! Is an owner-occupier of a home valued at under $3,000,000 (a copy of a recent council rates notice will be required). Sorry renters, still nothing for you. The household does not already have a solar panel system installed. Chooses Clean Energy Council (CEC) approved products and uses a CEC accredited installer (all 3 Phase Solar products and installers are approved / accredited). Has had an eligible solar panel system installed on or after 19 August 2018. Now is a great time to consider solar panels but you will need to be careful. When the cost of something becomes so cheap, the cowboys really come out to milk the system and risk the safety of those buying and installing. Remember the pink batts program? The last eligibility criteria is an attempt to reduce the risks but is inadequate. Many solar companies pop up from the ashes of dodgy old ones and we expect to see many new companies pop up in response to this program offering “fantastic” deals. The details on the program are light at the moment; to keep a track of any updates, check out the new agency Solar Victoria set up by the Government. Unlike the existing Federal Government incentives which you’ll usually see written up as an STC discount, this will be a rebate so will go directly to the home owner. That means you will need to fork out the full cost still but the rebate will come back to you. Since you are getting up to a 50% rebate, you can afford to choose a company with a good reputation offering excellent products and service. You’ll only get one shot at the rebate so take your time researching and make the right investment in a system that will last 25 years. Or just make the quick decision to do it right and go with 3 Phase Solar. If we installed the system for you, we will provide all the documentation required to claim your rebate with your system manual. Should I Add a Battery to My Existing Solar System? So you have a solar system and you’ve heard how great it will be if you add a battery to it. Perhaps the sales company told you your system was battery ready but the prices on batteries aren’t quite there yet. Are we nearly there yet? Let us show you the financials of a battery and you can better decide if they will work for you. There are different types of hybrid battery systems out there. Some will provide emergency backup when the grid fails and some provide other tangible economic functions but most are there simply to help you use the energy you generate rather than exporting it to the grid. We will focus purely on the latter. But first, can you even add a battery to a system you bought years ago? It’s not battery ready is it? Actually, batteries can be added to nearly any solar PV system. They are simply added in parallel with a measuring device put in your switchboard. In most cases, you can add a battery. We could go on and on about sizing the battery appropriately and how to do that. We will just focus on the economics and leave that for another post. It is probably easiest to start with the perfect scenario where the battery completes a full charge and discharge cycle in one day. We’ll use a perfect 10kWh battery for our example. This ideal battery will save no more than $550 a year to someone who has a solar system with the capacity to use it effectively. You must remember that this is with an ideal battery being utilised to capacity every single day. Unfortunately there are days like this, when even a 10kW system only exports 7kWh so wouldn’t get through a complete cycle. The only way to make sure you can charge it every day is to undersize it, in which case you probably wouldn’t notice the savings at all. Furthermore, even if you produce the extra 10kWh, your charging device might be limited to how much it can handle at one time. For example, if you are producing 6kW but can only charge at 2.5kW, you’ll export 3.5kW. You will lose storage potential if the charging is restrictive. You will be lucky to get 90% utilisation from the battery if it is well sized to your solar PV system. A battery that is too big could easily be down to 30% utilisation. That brings the savings down to less than $500 a year. Batteries also have inefficiencies. A lithium battery will typically only return 90-95% of the energy put in to it. That 10kWh battery is really only giving 9kWh (or needs 11kWh to charge 100%). Yearly savings are now only $450 a year. Batteries also degrade. A Lithium battery with a 10 year warranty, might only be producing 60% – 80% of it’s rated capacity by that time. We’ll be generous and assume nearly 90% of total energy throughput of the 10kWh/day advertised. Yearly savings are now only averaging maybe $400 a year. A good quality 10kWh battery can cost more than $10,000 when fully installed with the required electronics. Over it’s 10 year warranted life, it will save you perhaps $4,000. Probably doesn’t sound that attractive does it? You could shop around for a cheap battery but if you’re not careful, you might get lower capacity, lower charging rates, lower quality (degrades faster or fails) or lesser warranty. They’ll see you coming and sell you on the good feelings you’ll have when you join the battery owners club. In conclusion? It’s expensive, but you can add a battery to your existing solar system. There are plenty of other reasons to get a battery, just don’t expect it to make economic sense until battery prices drop significantly. Author 3phasesolarPosted on August 9, 2018 August 9, 2018 Tags battery, economics, savings, solarLeave a comment on Should I Add a Battery to My Existing Solar System? This is our solar blog site. We write about all things solar; answering common questions, exposing false information about solar from outside and within the industry and revealing the truth in detail about how solar can help save you money.